What does a homeschool day actually look like? Well, I know that I can speak for all homeschoolers and say that it looks different for each homeschool family. And that is precisely why we all homeschool – we embrace the opportunity to craft a daily routine that fits the rhythm of our homeschool, and we enjoy the freedom and flexibility to do so. I’m often asked what a typical day looks like in our house. So, I’ll give you a quick overview of our daily schedule for the 2018-2019 school year. Yes, I have a daily schedule. With 7 children all needing my attention, I had to sit down and map out our ideal day, so that everything could fit into our day. 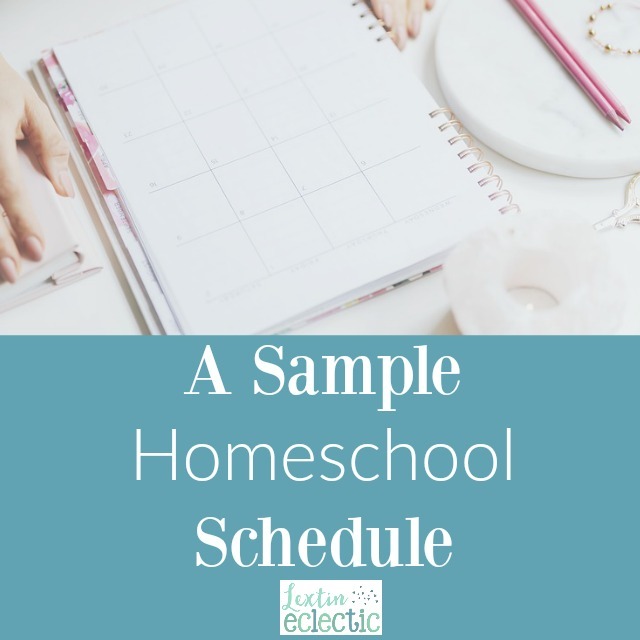 While we begin each year with a set schedule, it gradually turns into our daily routine that is a comfortable fit for our homeschool. Keep in mind that there is no right (or wrong) way to structure your homeschool day. But, I’ve found that having a general guideline that is broken into 30 minute time increments works the best for me as I plan my year. Here is what an ideal homeschool day looks like at my house as I homeschool a 7th, 5th, 4th, 2nd, and K student with a toddler and a new baby. After group school time, I rotate working individually with each child. The kids take turns playing with the toddler. The baby goes down for a nap right after our group school time. The kids also do some independent work as I’m working with other siblings during the morning. They do their piano practice during this time as well. My 7th grader has a weekly meeting with me on Sunday night when we plan out all of her assignments. After group time, she goes to her desk and works independently until lunch time. After lunch, the kids finish up any work that is not yet completed. Then we all have some free time in the afternoon. I work on my Bible study while the kids have reading time and then they play. By 3:00 we begin prepping for our nightly activities, which during the winter, are swim practices. Once spring weather begins, we will have golf on some evenings. Thursday is our field trip day, because sometimes Dad is able to go with us on that day. Thursday mornings the older kids have a private golf lesson. Dad takes them to the lesson and often participates with them. They come home and have a snack while Dad prepares to leave for work if he is going to the office that day. If not, he helps me pack up the kids and we leave for a field trip. On the Thursdays that we don’t have a field trip planned, we catch up on work from the week, do art projects, or watch some educational videos. Our schedule is busy, but we’re able to fit in all the essentials and still have time for sports, music, and field trips. I also have time to work part time from home while still making time for exercise and Bible study. I hope you enjoyed a glimpse into our daily routine. I tried to keep it fairly simple and flexible this year. My older kids are doing a great job completing some assignments on their own and I’m able to spend more time with the younger girls, teaching them to read and helping set the foundation in math.